Recipe – Everything-less Fruit Cake! If you’re a vegetarian cook, the chances are you’re already a fan of Rose Elliot. Described as the Queen of vegetarian cookery, she has been publishing cookbooks since 1967 and is still evolving and still at the forefront of exciting vegetarian food. In my home, her 1985 compiliation of recipes ‘Rose Elliot’s Complete Vegetarian Cookbook’ (re-printed last year) is my recipe bible and the first place I look when trying new recipes, or using a few old favourites. I’ve been making her Everything-less Fruit Cake for a few years and recently began experimenting a little with the ingredients, especially as I realised it was the kind of recipe that would work perfectly with gluten-free flour! The original recipe is ‘everything-less’ because there are no eggs or dairy, no added fat and no added sugar, the sweetness all comes from the fruit. It’s what my granny used to call a ‘heavy fruit cake’, meaning I suppose that it’s heavy on the fruit! So it’s rather like a traditional Christmas cake, or even a tea bread that tastes great spread with butter. Here, I’ve adjusted the ratios a little, so there’s slightly more cake and less fruit, and swapped some of the dried fruit for dessicated coconut. Perfect with that afternoon cup of tea! Set the oven to 160C (325F, gas mark 3). Grease a 900g / 2lb loaf tin and line it with baking parchment. Put the dates and water into a saucepan and heat gently until the dates are soft, then remove them from the heat and mash the dates. Add the dried fruit, flour, coconut, baking powder, spice, grated rind and orange juice. Stir well to combine the ingredients. Spoon the mixture into the tin, level the top and sprinkle with seeds or almonds. Cover the cake with tin foil and bake for about 1 1/2 hours, until a skewer or sharp knife inserted into the cake comes out clean. Uncover the cake for the last 15 minutes or so to let it brown. Cool a little in the tin before turning out the cake and cooling it on a wire rack. The Moosewood Restaurant is a collective run operation in Ithaca, NY, which was first set up in 1973. The collective has also published at least 12 cookbooks and their fresh and ever changing approach to vegetarian and healthy eating has been highly influential. Unfortunately I’m a long way from Ithaca and unlikely to eat in the restaurant any time soon (anybody out there want to offer a review? ), and I had previously only glanced at copies of their cookbooks, but I have been seriously impressed by this, their latest effort and would be happy to recommend it to anyone looking for exciting healthy recipes, as well as for vegetarian, vegan and raw food. As well as the trying out the recipe below, I made a version of their Sweet Potato Pie, which tasted much sweeter and richer than the healthy ingredients might lead you to believe, and I’ve lined up a list of recipes to try next: cauliflower tabouli, raw broccoli salad and vegan cornbread. This recipe for Pomegranate-glazed Tofu was a revelation! Absolutely delicious and destined to become a firm favourite, both as it is, and, as is my way, inspiration for further experimentation. In a large skillet on medium-high heat, warm the olive oil. Add the tofu cubes and cook for about 3 minutes per side until lightly golden. Whisk together the pomegranate juice, garlic, soy sauce, mustard, orange zest, and rosemary. 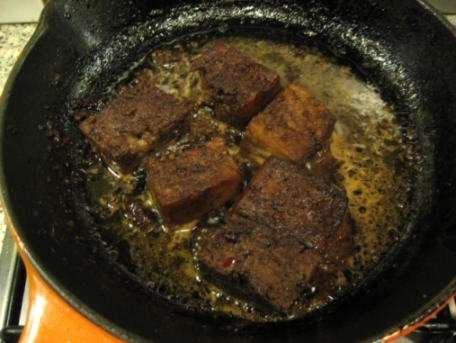 When the tofu pieces are golden, pour the sauce over the tofu and continue to simmer for 3 to 5 minutes until the tofu has absorbed some of the sauce and the rest has reduced to glaze.